Programme 2016 – This new section provides an introduction to our programme and the list of workshops, webinars and courses that we will offer in 2016-2017. The section also includes a list of our online resources and a guides to the University resources for professional development organised to the Researcher Development Framework. Follow the links below for details. Please note: Only one workshop is currently available for booking as below. We are still finalising the main programme and we expect to announce workshop dates and open booking in September or early October. Your Development This is a new section that introduces professional development for postgraduate researchers, with guidance to help researchers start the process. The section also describes the specific parts of our programme for new researchers and advice for international researchers. 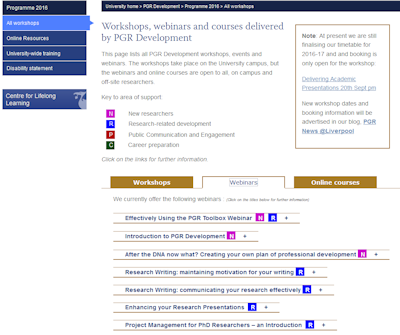 PGR Toolbox –This section introduces the PGR Toolbox and software contained within this part of Liverpool Life, together with the institutional requirements and further links to our supporting online tutorials. Booking is now open for this half-day workshop which offers an experiential learning experience to develop and gain advanced presentation skills within a supportive environment.